Discussion in 'Downhill & Freeride' started by saruti, Aug 14, 2012. I found out, that the thing that makes the bike better than others in my opinion is the rearward axle path of the rear wheel. At least on the first 1/3 of the travel. I love my dwlink trail bike (5") and how it act when encounters square edge bumps. But I found out that on a VPP (my friend trail 5" bike) it's even better. But on DH bikes the pedaling is less important, and the square edge/ rear axle pate is more important. I've demoed a trek EX trail bike and didnt like it compared to my dwlink trail bike. It didnt swallow the square edge bumps. I now looking to replace my old dwlink trail bike for a new bike (5 or 5.5" travel). And really want a trail bike that pedals good as the dw. And swallow square edge bumps like the VPP. What makes you prefer one bike on the other? Where can I find info about axle paths of different bikes? And if you have any suggestions for me for a trail 5 or 5.5" frame... please say. I definitely think that on a DH bike a bit of rearward axle path feels really good in the rough. The bike feels instantly more forgiving and you can plow more confident. But it has to be combined with a moderate ramping. So the whole kinematic of the bike plays a role I think. 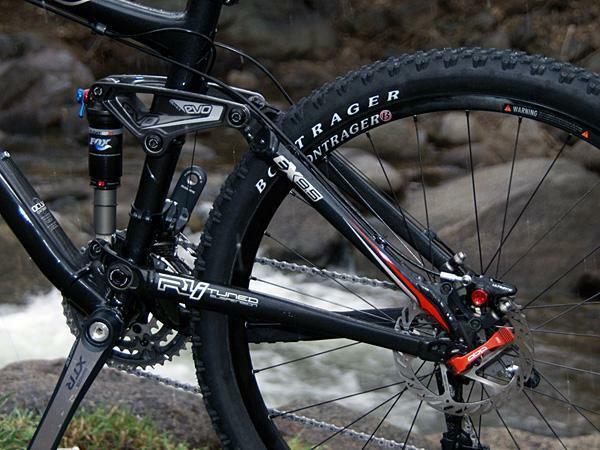 Ibis Mojo or Intense Tracer. The differences that you are feeling between those two bikes doesn't come from having different axle paths, because the AP of the DW it's actually better than the SC. They come from having different Leverage Ratios. SC bikes are all the same, very soft in the middle. Some people like that a lot, but sometimes (DHX Air...) it feels too soft. Check bikes out on Linkage. While you're there. Please post up the Alutech and Nicolai that have Pinions on here so I can see what's more rearward. Check out the Mongoose and GTs. I know high single pivots pedal really well with an idler, as the high pivot naturally is resistant to bobbing, and if there's a small amount of chain induced anti squat they're even better. My Zerode axcelerates briliiantly. Not sure what effect the I-Drive has on the high pivot GTs and Gooses. Ideally they'd have an idler instead, but they don't. I love my Mongoose EC 4X, one of the most fun bikes ever. Havn't tried a new Goose, but I did have the older 5" one, and it wasn't the best. Can't recall the name of it sorry. I think you'd actually find that the axle path isn't entirely dissimilar for either of those three bikes, EX included. Maybe I'm way off, but I bet you wouldn't find a significant difference between the two 5" travel bikes (EX and DW) but the DW is likely to have a flatter profile to the trek's semi-circular pattern. I'd bet the reaction you felt is to the shock tune, as the real beauty of the DW link system is that everything works in harmony, vs. other bikes which are hits and misses. Leverage rate, shock tune, air volume, axle path, all those things are figured out. The fuel is actually a pretty high pivot for a single pivot. It's pretty much the highest thing out there aside from an Orange, and certainly higher than most or all Faux-bars. If you want good square bump performance, I'm personally keen on a higher pivot with a rising rate. I don't see a great reason to convolute a system that works well already with flat nor falling leverage rates. Any single pivot higher than the middle chainring is really going to sing over most bumps, any higher than that and you start messing with idlers or lots of chain torque. I'm in the same boat as you. I loved my IH MKIII, and after cracking it in three different places I'm considering upgrading to 5.5-6 inches of travel, without loosing the pedalling efficiency and square-bump absorption. After a long deliberation, I think I'm going for the Turner 5-spot, since it has the amount of travel I need for the local terrain, and a more forgiving geometry than the Ibis. Plus, I still don't feel comfortable enough with the whole carbon thingy (I've seen too many broken frames down here). The only concern I still have about the Turner are the bushings. I'd like it better if it would pivot on sealed bearings, but so far, seems like the ones out there are still hanging pretty well. I was also considering a Banshee Spitfire, but looking at all the pivot-axles-being-chewed-down reports I've found, I desisted. Sandwich, you think the trek EX I demoed had a poor settings on it shock? Maybe I should check this bike again... it looks sooo good. I tried an EX about two months ago. A 2011 model, I think. I must say it pedals damn well, but it lacks that "magic carpet" feeling I got from the MKIII. Also, I'm a heavy guy, and a friend of mine busted the seatstays of his EX, and he is by no means a heavy hitter. If you want a lighter build, I'd say you should go with the Ibis, or consider a Santa Cruz Blur LT with a Pushed rear shock (I forgot to mention my MKIII had a Pushed Fox Float R and it felt damn well). I can't imagine that the fuel would be hindered on square bumps. It's pivot is way up there. It might even have a more rearward path than the dw-link, looking back at it. I haven't checked the linkage diagrams, but visually it looks like a pretty high pivot. I rode one for a couple years and loved it. The suspension worked really well, and I loved the split/active brake/ pivot. The suspension is neat because, based on the chainring you're in, you get a different amount of pedal feedback. In the middle ring there is virtually none. In the big ring you can't feel anything anyways. In the small ring though, you get a little bit of bob/biopace/anti squat that helps the bike dig in on steep climbs where you'd need it. I haven't ridden one with the drcv, this was just a standard RP2. Sandwich, I only run single ring front, with a chain guide. you just made me want to try the EX again, this time I'll try diferent settings to the rear shock. Give it a shot, maybe test a remedy too, as that's 5.9" of travel vs. the fuel's 4.7". That may affect, to some degree, the feeling of "plushness" over square hits. Running a single ring is going to give you great pedaling performance on a single pivot bike, so long as you can tune chainring size to pivot height. Something like a 32-36 on the trek is going to pedal pretty well. Any lower or higher and it might have too much or too little of an effect. I took my DHing up at burke MT once and I thought it was really capable. Everything up there is pretty 'green square' but some woods sections definitely had some rough spots. The new morewood should be a great ride too. No idea on release date, but if you're patient, that thing looks awesome, and the pivot will be above even the mid ring, so you're looking at a great sprinter and great square bump performance. Some feedback if you crank through rooty sections though. I have a downhill bike, so I keep my trail bike on the less travel = 5 - 5.5" . the remedy is too much for trail rides (XC like). Try one of these with a light compression tune. Kidwoo. you mean try it on a EX ? my float r is low tuned and its ending is botoless. will it work on the EX ? Mine has virtually NO compression damping, as required by the DW-Link system to perform as expected. Now that the frame is broken, a took a shot and tried the Pushed Float R on my Prophet, replacing the stock RP2 (which is leaking air BTW). It felt like the suspension really came back to life. The rebound adjustment range is much wider and fast than in the stock RP2, which IMHO is overdamped. I'd also second Sandwich's suggestion on the EX, the new Morewood, or maybe the Devinci Dixon. But with what I meant and with what shady's saying, it's all about the combination of shock and frame. It's REALLY important........moreso than percieved differences in axle path. Only with DW can you achieve harmony? WTF are you on about? Dude, I'm the biggest critic of DW and his posse on this forum. Don't take a quote out of context and add some fluff to it to make it seem like I'm saying ONLY DW bikes have been figured out. DW designs everything on his bikes. Everything. They're all linked together so they work the way that he intends them too. You need a specific shock, with a specific air can, and a specific tune, with specific settings, and a specific amount of sag, a specific chainring height, and you get a really good ride out of it. SOME other bikes aren't poured over the way DW bikes are. They may be designed around simplicity, like a single pivot. Not much concern is given to leverage rate, because at 4.5" of travel, it's going to be overshadowed by an air shocks natural ramp up. Or braking performance on that same single pivot, because again, 4" of travel. Or the low main pivot of an specialized FSR bike, which doesn't pedal terribly well, but you're willing to overlook that because the rest of the bike is so good. It's not to say that other bike co's and designers don't have it figured out, or that their designs don't work 'harmoniously', but the DW package is pretty specific, and when it's figured out for a rider, going to another bike that may require a bit more air, a bit more or less sag, or have slightly different characteristics (like leverage rate), it's going to throw off that rider's perception of what "good" is, whether or not it's better. Try the Banshee Spitfire or new Rune. Both are designed w/rear axle paths for the first part of its travel. This may be too heavy and too much travel for what you are looking for but the Scott Voltage FR has a fairly high pivot too. I've run a coil and air on mine and felt that both did a good job gobbling the chunk on trail rides. What really indicates how well a bike deals with rough stuff, especially square edged hits, is the radial component generated by any bump input with respect to the axle path (defining force vectors as being either normal/radial or tangential to the axle path here). Small changes in pivot height create generally proportionally small changes in bump absorption capabilities, and anything that pedals reasonably well with a conventional chainline (not an idler) has, for bump absorption considerations, a pretty similar axle path around the sag point. It's worth noting that pedalling performance is HUGELY sensitive to axle path differences, as in a degree or two of difference either way has significant effects, but bump absorption is nowhere near as sensitive to those changes. Until you get to really high pivot/idler type setups, the differences in wheel rates (cross product of the frame's leverage rate and the spring and damping rates of the shock) make a much bigger difference to bump absorption performance than the small changes in axle path. The kind of difference you may feel between a dw-link bike and a VPP bike with the same travel in terms of bump absorption is almost nothing to do with axle path, and very much to do with the combination of leverage rate, spring rate and damping rate that creates an overall characteristic at the axle, that resists the wheel moving out of the way when you hit a bump. A more compliant spring/damping rate at the wheel will greatly reduce the radial force component on the swingarm/suspension, creating a similar result to a higher pivot. I agree... OP is barking up the wrong tree WRT axle path. If you look at what Trek did to improve square edge performance on the '12 Sessions, they did not change the pivot location, they added .5" more travel and a more linear shock rate in the mid stroke. I am rocking the exact trek you posted (color and everything) as you may recall my GF bought it originally, but was just too big for her. Recently I added a chainguide and converted to 1x9. I couldn't be happier with the way it turned out. I primarily ride in the Southeastern Michigan area, fairly buff and flowy trails, however we have a ton of tree roots on some trails, not a lot of square edge rocks though. It seems to eat everything up pretty good. I've ridden it in some rocky areas well north of here, as well as on the XC course at Seven Springs and never wanted a different bike. I'm running a 11-34 cassette and 33t up front. what bike? fuel EX? or remedy? Personally, I like Z-shaped axle paths; it's like a backwards S, but sharper. Fuel ex, I'll have to double check shock in the morning. Its the stock suspension.